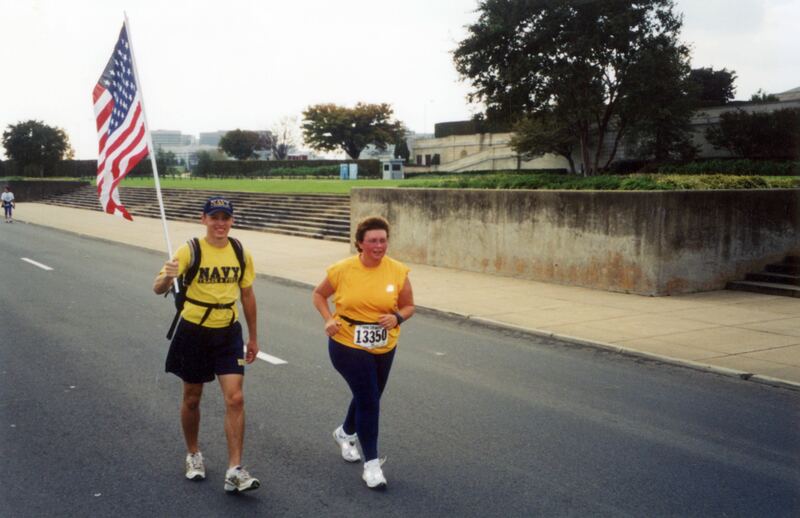 It was a completely ridiculous notion-that a chubby, middle age military mom would attempt to run (ok lets be honest-waddle )the Marine Corps Marathon. It was 2003 and I had something to prove. I needed to find a way to bury the layers of stress that were beginning to build up as one by one my children were signing up to serve our nation. So there I was -so hot that we cut off the sleeves of my shirt, with my son and the American flag at my side almost every step of the way. You will notice he is walking-that is how slow I am. But an amazing thing happened as he sheperded me on my way mile after mile. As the flag passed every uniformed Marine did what they are trained to do -saluted. And each salute pushed me onward. Make no mistake it was a family effort. Everyone was with me along the course. But my future Marine and that flag paved the way-just as it does now every day. Because it still stands for everything that matters to me in this nation of ours-freedom and the opportunities that do not exist in most of the world today. I have run/walked/waddled the MCM twice, and stood by at least ten times as members of my family have run it, including my Marine in boots and utes. I have held a flag high in honor of the fallen. To those of you running this year-run with honor. Remember you are running with heroes of every kind. Take a moment and look up from your watches and take it all in. And for my people-remember there is no last place. If you are runners like me who run to prove something-that you are stronger that you think and braver than you ever thought you could be congratulations. You are special. 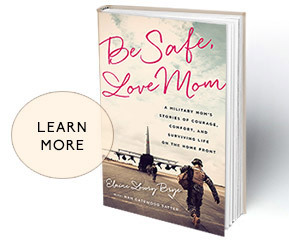 That is something we military moms prove to ourselves over and over again each time we say goodbye to our precious children. Semper Fi. May you all finish strong.